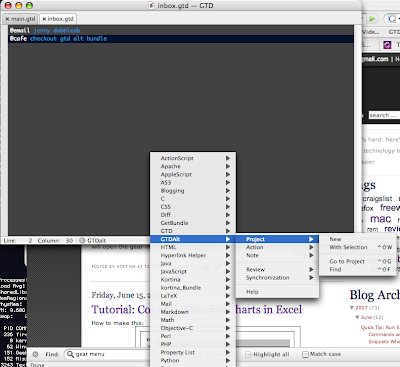 and start typing the name of the command and Textmate will autocomplete it. If you don't know the bundle item name, you can use the gear menu at the bottom of the window to look through the items in the bundle you're currently using. I knew there was a shortcut for this, but always forgot it, so I looked it up today. will open the gear menu. I'll be using this one alot.